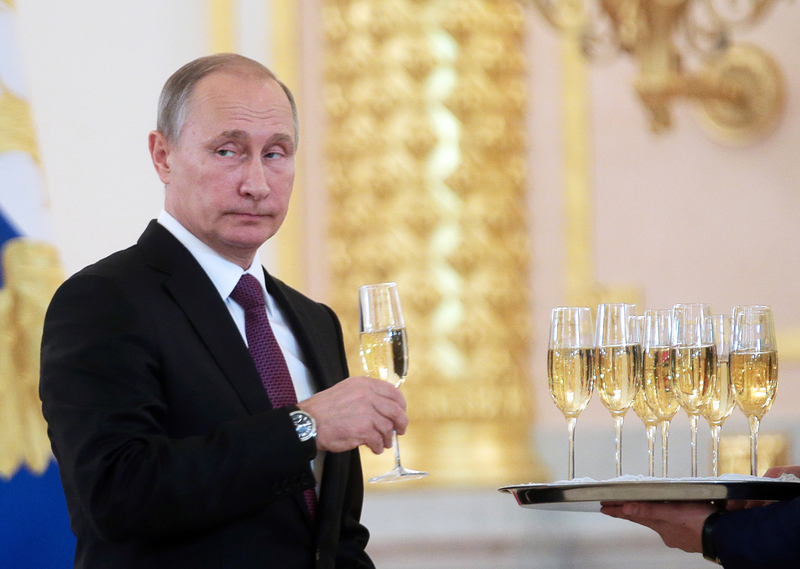 Russia's President Vladimir Putin holds a glass of champagne at a ceremony of presenting credentials by foreign ambassadors at the Alexander Hall of Moscow's Kremlin. Usually the Russian president's salary is – at least officially – the smallest among all top Kremlin officials. However, Russian presidents are rarely worried about the amount they earn. Unlike the United States, where for the last 15 years the president's salary has not changed, in Russia the presidential salary is constantly changing. In 2013 Russian President Vladimir Putin's officially declared salary was about 306,000 rubles ($9,500) a month. In 12 months he earned 3,672,000 rubles ($115,000). The following year his earnings drastically increased, exceeding 640,000 rubles ($16,000) a month and 7.7 million rubles ($193,000) a year. But in spring 2015, as the ruble fluctuated sharply, Putin lowered his salary by 10 percent. Nevertheless, in 2015 he earned 8.9 million rubles ($137,000), or around 740,000 ($11,500) a month. The salary reduction will be calculated in the next fiscal declaration, that is, for 2016. Usually the Russian president's salary is effectively – at least, officially – the smallest among all top Kremlin officials. However, it often happens that the presidents are not so worried about that amount. "Honestly speaking, I don't even know what my salary is. They deliver it to me, I take it, put it my bank account and don't even count it," Putin once said. It was Russia's first president, Boris Yeltsin, who in 1997 obliged officials to publically report their earnings. As befitting a head of state, Yeltsin began with himself: In March 1998 he was the first official to publicly declare his earnings. His property and total income were valued at 1,950,234 denominated rubles ($325,054). This figure was composed of his total wages, royalties from his book Notes of a President and interest on his savings in Russia’s Sberbank. Today historians even have information on the paychecks of Soviet leaders. "In December 1947 Stalin's income as Chairman of the Council of Ministers was 10,000 rubles. Yet it is unclear whether this figure included his salary as Secretary of the Central Committee, which was 8,000 rubles," notes Oleg Khlevnyuk, who specializes in research on the Stalinist period. Moreover, the general secretary was also supposed to receive royalties for the millions of copies of his works. There was a famous episode in which Stalin sent his childhood friends in Georgia a large sum of 40,000 rubles. In comparison, the average annual income of a Soviet citizen in that period was 7,200 rubles and the monthly salary was 600 rubles. Peasants in 1950 earned less than 100 rubles a month. But Khlevnyuk suggests that we do not pay much attention to the official salaries of Soviet leaders. Whatever they were, millions of rubles went into the maintenance of dachas, guards and servicing. "After 1947 dad sometimes asked me during our rare encounters, 'Do you need money?' I would always say, 'No.'" writes Stalin's daughter Svetlana Allilueva in her memoirs. "'You're lying,' he'd say. 'How much do you need?'" "I didn't know what to say. He didn't know how much contemporary money was worth, or how much anything cost. He lived with his pre-revolutionary idea that 100 rubles is a huge amount. And when he gave me two-three thousand rubles, whether it was for a month, for half a year or two weeks, he believed he was giving me a million…"
"Each month his entire salary would be packed in envelopes on his table. I don't know if he had a savings book – probably not. He didn't spend the money himself. There was nowhere and nothing to spend it on. Everything in his life – the dachas, the houses, the servants, the food, the clothes – was all paid for by the government." Doctor of Historical Sciences Oleg Budnitsky says that "real" money had no meaning for Russian leaders. As much as Lenin earned, it was extremely difficult to buy food with this rapidly depreciating paper. An incident that once occurred with Boris Yeltsin vividly demonstrates Russian leaders' relationship with their money. Attending the opening ceremony of the Russian Bistro domestic eatery chain, Yeltsin selected some food and went to pay for it at the cashier. Obviously he did not have any money in his pockets and his colleagues had to help him. But still for some time Yeltsin could not understand exactly how much he had to pay. Baffled, he continued counting the notes in his hands – he had really forgotten how to handle money.